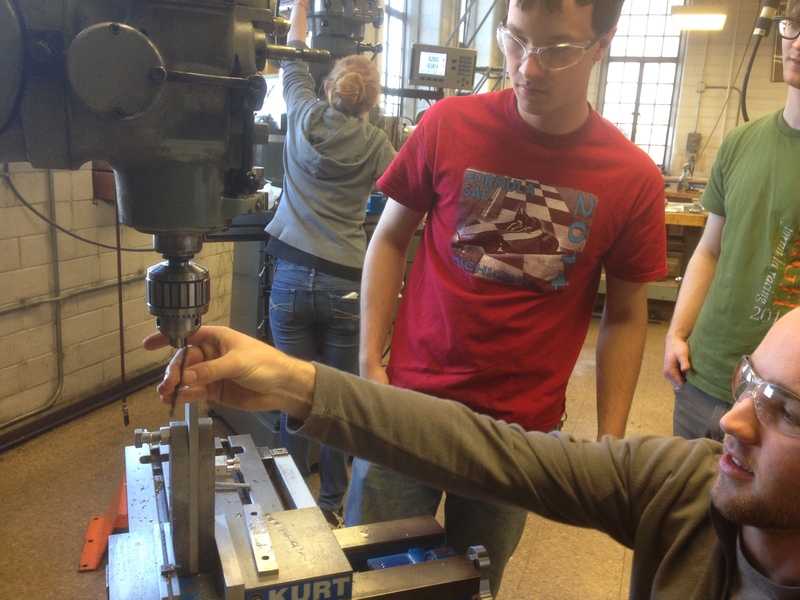 This past Saturday, we a had another Formula SAE meeting and we continued our jig production from the weekend before going at a faster pace since we were now able to get the hang of machine cutting. This picture here was when we had to drill holes of a relatively larger jig than before and David, the one putting in a screw inside the chuck was making sure the screw was high enough so that we could make the hole inside the jig. We had already lowered the machine cutter all the way to the bottom and there would have been a slightly bigger problem if the jig could not fit underneath the screw, but it managed to and I took care of that bad boy. But wait!! What are jigs per say and why are you making them? Great question! Jigs are aluminum parts of metal which have holes inside them that are used to weld the frame of a car in our case. Jigs do not necessarily go on the car, but they are used as a medium for holding and welding a car. When we get there, I’ll be sure to post some photos to show what I mean.